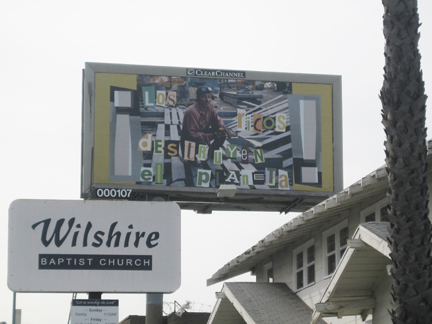 "Los Ricos Destruyen el Planeta"
Allan Sekula, Beverly Boulevard east of Western Avenue, Los Angeles, February-March 2010. Part of "How Many Billboards? Art in Stead" temporary project organized by the MAK Center for Art and Architecture. "A welder at a construction site holding a lit acetylene torch and crouching over his work takes a moment to look directly at the viewer. 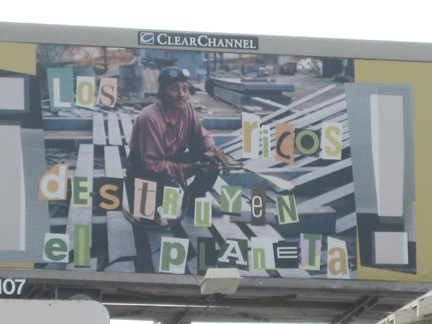 The words "The rich destroy the planet" are superimposed in Spanish over the photograph." - text from a longer description by Lisa Henry, http://www.howmanybillboards.org/, accessed 03/2010.